The sun filtered winsomely through leafy canopies above. Dappled brown earth stretched out between trunks of massive trees, blinding little saplings. Here and there in the canopy was enough of a gap to let a whole flood of golden sun fall onto the forest floor, creating oases in which fresh green life was brimming. A tree had fallen across one such pool, weighed down some years ago by ice or slain by wind or storm. The ancient gray trunk was now softened by time and thaw. Around it buds of primrose (pale green pods full of unborn sunlight), and young creeping ferns grew, along with a few thin-stalked young trees, with barely any leaves yet to identify them. Within this patch of gold sun and fragrant summer lay the little filly this morning, alone. Lounging with her head on an Artist’s Conk and her legs spread out on the carpet of green plants. Her pale, metallic coat glittered in the light that fell upon her. The thin strands of her mane like liquid gold against the faded gray of tree and fungus were spread in haphazard disarray. She had been hard to notice before the sun came up, for she was very still. Her shimmering, pale flaxen hide was almost the same colour as morning sunlight and – lounged as she was on the east-side of this log in the direct light it was just possible to imagine that she had fallen through the canopy with the dawn. The picture stayed this way: static and waiting for one long, slow minute until the stillness was broken by a rustling, hopping rodent that stole across the ground in search of snacks. and he ran – and so did she; exuberance and bright young energy in a bounding playful agility. He scurried across the cleared earth floor of the forest a few dozen yards, the filly in hot pursuit, before leaping up the trunk of a wide old tree and spiralled upward. Coming to an abrupt and unceremonious halt at the base of the tree Alayaya reared up, planting her fores against the trunk and peering upward at the boughs above. She followed the progress of the little brown rodent, head weaving as he did through the branches. Above her head about forty feet he made a leap to the next tree and she, craning her neck backward to keep him in view, overbalanced, flailed with a squeal, and fell onto her back. With a snort she rolled over and climbed to her feet again. Then she was off without a second glance for the little rodent – racing under the branches overhead, leaping from patch of sunlight to patch of sunlight, until the light disappeared. Even then, like an overgrown firefly, she seemed to shine unexpectedly, like a firefly in the dimness of these red columned halls. Did she know where she was going? Suddenly, she turned at 90 degrees and pelted at full speed, emerging in a few moments under a patch of the bright, cloudless blue sky, a tiny meadow shaped in a perfect rectangle. She was oblivious to the history of that shape, of the peculiarity of such unnatural geometry, of the half-sunk, crumbling stonework at its edges. Grass grew up to her ankles here, with forget-me-nots adding splashes of early blue to the green waves. She flung herself into this sun-soaked oasis, a shriek of delight trailing after her like gossamer and promise and collapsed onto the ground, rolling in a patch of forget-me-nots, giggling. And there she waited, flopped on her side in the sun, expectant. One ear twitched, almost involuntarily, just the slightest flick backwards. Then another faint peal of laughter floated through the still morning air, made soft by distance but clearly discernible from the background melody of rustling leaves and birdsong, and this time the ear swiveled hopefully to catch the sound, pricked with attentiveness. A moment later, her mother's voice stopped in the midst of reciting morning prayer. "Kasumi-chan," Higurashi coaxed gently, and the filly looked up at her mother a little guiltily, knowing full well she had been caught red-handed in her inattentiveness. "Gomen nasai, Haha-ue," Kasumi murmured, dipping her gold-crowned head briefly in apology. Her mother priestess was not a harsh teacher, but she did hold her pupil to high standards of respect and discipline, and Kasumi was an obedient child. Higurashi smiled faintly in acknowledgment, but said nothing as she too paused to listen more closely to their surroundings. Sure enough, before long the serenity of the early morning forest was interrupted again by the unmistakable sounds of someone dashing through the underbrush some distance away, followed by another squeal of delight and girlish giggles. Two pairs of golden eyes met one another, and the priestess offered her daughter a wry quirk of the corner of her mouth. "Ano na," Higurashi mused thoughtfully, stretching out her neck to gently brush her muzzle against the filly's dark grey cheek, "shall we have a look, Kasumi-chan? We can continue this another time." Quiet and serious as always, Kasumi said nothing in reply, but the eagerness with which she scrambled to follow after as her mother led the way betrayed how thrilled she was to set aside her studies and embark on this adventure. At first she was content to let Higurashi lead, but soon her excitement got the better of her and the stone-and-amber filly moseyed on ahead, eyes bright and gleaming and dished head held high as she searched tirelessly for the source of the laughter. Although her search pattern was far from efficient, wandering the forest in vague directions like a lost and bumbling bee - her mother, ever-patient, trailed behind with some amusement - at last a scent of someone wholly new and unfamiliar drifted past her nose. Kasumi dutifully followed it with a renewed sense of purpose and direction, until at last her path brought her emerging into a rectangular clearing, full of flowers, sunshine, grass, and one very golden, very intriguing young girl. The kirin girl stopped dead in her tracks, suddenly quite uncertain what to do now that she had actually arrived at the destination she had been seeking so doggedly. For a second she stood dumbly, taking in with wide eyes the way the strange filly gleamed in the sunlight where she lay like a figure carved of warm marble. But at last the manners that Higurashi had so carefully instilled in her took over, and cautiously Kasumi stepped forward, calling out to the stranger with a gentle "Ohayou". By the time that Kasumi and her mother came upon her (though it could be no more than a quarter of an hour since her own arrival in this unnaturally-shaped clearing), she had lost herself into a daydream that might have been an actual dream. She heard the approaching steps, but they wove into her imagination, and it was only when Kasumi’s voice broke the boundary of real and surreal that Alayaya was truly alert again. She turned her head without lifting it off the ground and looked up at the little filly, her blue eyes alight with delighted surprise. From across the empty space between them, with the sun wrapped around Kasumi from above, the light fell through the ornate antlers on her head and threw a dappled shadow across her face. Alayaya, with thin legs akimbo, was a comical tableau for a moment. She rolled over again in a tumble of shimmering limbs, shaking crushed blue flowers and loose stalks of grass from her undergrown mane in a halo reminiscent more of spring than autumn, and adopted a pose more proper for the reception of company. The sun clung to her where she lay. There was no magic to it, just the pale flaxen colour at the right shade and the metallic shimmer of her (ironically stealthy) desert ancestors. She was incandescent in the rich green of the season-defying grass. With Alayaya there was never a suggestion of indecision. Even her surprise was underscored by her boundless, impossibly founded confidence. It had a happy eagerness to it that was almost palpable around her as she tucked her feet prettily under her again. Her eyes, blue and boundless as the overhead morning sky, were full and attentive to the diminutive, nuanced form of Kasumi with her delicate but unmistakable crown. The weight of future responsibilities, resting so elegantly on the little head. Whether Alayaya understood or did not understand the words spoken was not immediately obvious. Possibly she sensed the politely covered eagerness, or perhaps she simply took the tack which suited her most in the moment. In any case, pose accomplished, she wiggled back into action, scrambling energetically, but with a little too much grace for her age, to her feet. Picking her way carefully, perhaps theatrically, out of the flowers, she waltzed toward the filly. “Hello!” she said, and smiled; a fleeting, powerful expression. She stepped forward, weaving under the antlers to press her muzzle gently to the filly’s cheek in greeting. 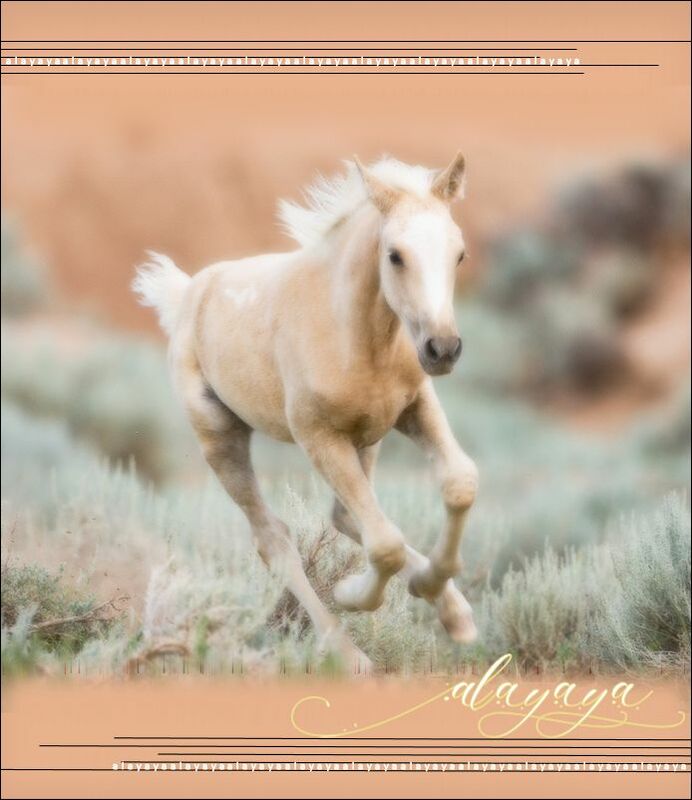 For Alayaya there seems to be no filter between intuition, action, and energy, she did what was sensed was right to do in the moment, untroubled by doubt. “Hello, jamila! Who are you?” she asked without pre-ambulatory introduction. Her eyes, taking in Kasumi’s unique appearance, were clearly enamored. She looked up to Kagura’s serenely attentive figure. The cloudless optimism of those blue eyes betrayed something melancholy there, something less light than the attitude she held… or maybe it was just the shadow of her pale forelock, briefly obstructing. Unrestrained, and radiant only of open acceptance, Alayaya flung herself nimbly forward and touched her cheek to the larger mare’s, too, murmuring a deferential “Net” as she did. Alayaya smelled like grass and forget-me-nots and sunshine, like hope and unbroken promises. She spun instantly away again, however, her attention shifting from the serene mare to the smaller, more exciting figure of the daughter. She settled back into her place before the filly, and gestured to the patch of pale blue flowers behind her. “Do you know what these flowers are called?” Kasumi was younger than Alayaya was, but Alayaya had spent little time with children and she felt no inherent superiority in her larger size and greater age. Her voice carried no condescension, and none of the false brightness that adults sometimes apply while speaking with children in their efforts to ‘get on the same level’. She had an earnest, genuine curiosity, and hoped that Kasumi would have the answers she sought. Net = roughly translated as divine mother - egyptian. Where Alayaya was all sunshine and unbridled enthusiasm, Kasumi was a gentle beam of moonlight, a retiring and unobtrusive presence that lit up with a pale and waning glow rather than gleaming incandescence. She made no effort to get any closer to the other filly than she already was, as though reluctant to step out of the dappled shadows and fully out into the sun's rays. But nor did she shrink away when Alayaya came bounding forward to greet her, not a hint of shyness or alarm to be found on that solemn little face. Instead, there was only a rather subdued curiosity about her, her fascination shining through mostly in the attentive forward tilt of her ears and bright, searching eyes. Everything about the fearlessly friendly golden girl was new and intriguing to young Kasumi, who had spent most of her young life so far secluded from all except her mother and adopted brother. The little priestess in training seemed hardly to know what to do with all that youthful, innocent energy, girlish charm, and most of all that air of precocious confidence and wisdom that radiated from Alayaya as sunshine did from the sky. So mesmerized was she that she didn't even remember to bow properly before the desert filly was already up in her face, touching her cheek in a gentle but wholly unfamiliar greeting. Kasumi's eyes blinked open wide, like smooth golden gems devoid of flaw or marking on their surfaces, and instinctively she pulled away a little in surprise at the unexpected touch. But then the moment passed, something seemed to click together in her whirring brain, and the jewel-crowned filly tentatively returned the gesture with a little nuzzle of her own to the proffered cheek. The other girl's initial question went unanswered at first; Kasumi watched with continued silent wonder as she next approached the colorful figure of Higurashi with equal warmth, repeating that affectionate greeting with the lady priestess. Much more socially fluent than her daughter, Kagura accepted Alayaya's touch with the effortless grace that Kasumi still lacked, returning with a warm smile, her own affectionate nuzzle to the filly's mane, and a gently murmured, "Hello, sweet child." But there was no doubt that the sunset-painted lady intended to remain only peripherally involved, as she contributed nothing more and watched passively from the edge of the clearing. (Kasumi knew her mother well enough to know that nothing would escape the notice of the priestess's eagle eyes nevertheless.) The flow of conversation then naturally fell to the two youngsters, and the little kirin girl stepped bravely up to the plate despite the novelty of the whole situation. At last Kasumi gingerly stepped forward, as carefully as though treading on thin ice, though her step grew bolder and more assured as she finally emerged into the openness of the clearing. Sunlight, disentangled at last from the leafy canopies overhead, streamed over her horns and amber carapaces in flashing rivulets, throwing the brightness of her scarlet and violet coloring into sharp relief against the stormy grey of her body. Almost absentmindedly, she reached out with her crowned head and plucked a stubbornly clinging blue flower from her companion's pale mane, then dropped it and watched as it lazily drifted down to the grassy floor. "Ayaya-chan," she said, making up a nickname on the spot and returning her earnest golden gaze to the other girl's, "are you thinking of anybody?" Alayaya almost palpably thrummed with a lively, undulating music just contained in by the fabric of her skin. It underscored her movement, her laughter, the light brush of her gaze. She was ebullient and uncompromisingly confident, fearless without bravado. She clearly revelled in the attention of others, but it found her because of the unpretentious honesty of her self-portrayal. “Wasurenagusa, forget-me-not” Alayaya repeated both names, emulating the musical quality of it as Kasumi pronounced it. Attentively, the flaxen girl waited on the smaller filly’s words, careful not to miss anything that was said. Her focus was singular, almost dramatically executed – every new emotion was an opportunity to explore its range and test out its depths. She, though unsubdued, never overshadowed those around her. Dramatized or not, it was almost like sunlight itself, enveloping the object of its focus with complete and utter singularity. Kasumi’s intellect was combined with a natural empathy. She had a keen ability to cut to the heart of the people around her. She did it, of course, rather naturally and without inhibition in the moment. Alayaya’s red and gray companion was stepping out of the literal shield of her own skin with sincere determination into her own, more extroverted circle. The golden filly beamed appreciation for her new name. Ezariel had no nicknames for her, and she liked the novelty and the immediate familiarity. She had an odd relationship with names. Ezariel had named her, when he found her, because she had been unable or unwilling to offer up a name for herself at the time, and he had needed to call her something. It had probably been intended as temporary, but Alayaya had simply accepted it, and Ezariel had eventually stopped inquiring over her previous name. She had also taken it as license to choose names for her companion. She changed his name with relative frequency, actually. Good natured and self-assured as he was, he never complained. Ezariel was the latest and so far, the most outlandish christening. It bordered quite close to satirical, but she was still too young and too sincere for satire. Alayaya’s face transformed with intense concentration. She had been thinking about someone, or dreaming about someone, just a moment before Kasumi had arrived. “I was thinking about…” The figure, poorly formed in her mind’s eye to begin with, more intuition and emotion than objectively drawn, was hard to pin down now. “My mother!” It was almost triumphant, she even radiated a little pride at having pinned down the mysterious memory. The admission did not trigger any additional emotion from the golden filly. She pronounced the word ‘mother’ the same as she might have said ‘friend’, ‘pet’, or ‘ticket salesman I met at the theatre’. As matter-of-factly as Kasumi named the flowers. Her mother was a distant memory; she had lived as long without her as with her, and she was not yet a year old. There was no one to keep her memory alive for the daughter. With enough time she would, perhaps, become as much a character in a story as a memory. She settled her gaze comfortably into Kasumi’s keen golden one; her features melting seamlessly back into unencumbered happiness, sharing the moment with her new friend. Kasumi’s earnest, careful grace was as inviting of confidence as Alayaya’s unjudging interest. “Now I am only thinking about Kasumi.” She leaned in toward the smaller girl, conspiratorially, “Are flowers the only plants with language?” She asked seriously, looking up at the towering redwood trees. In her blue eyes was reflected a world where the trees spoke, murmuring eons of secrets.